Here's how the newest addition to the home improvement retailer's empire is paying off. 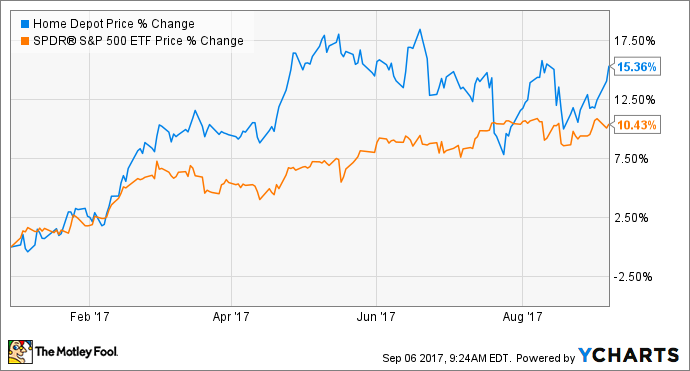 While retail stocks have been hammered on Wall Street lately, one of the few exceptions to the rule is Home Depot Inc (NYSE:HD). Since the beginning of the year, the giant home improvement retailer has given investors a greater than 15% return, handily beating the S&P 500 year to date. In its second quarter, Home Depot once again showed why it is still one of the best companies in the retail sector: Net sales grew to $28.1 billion, a 6.2% increase year over year, and diluted EPS rose to $2.25, a 14.2% increase. The all-important comparable-store sales were up 6.3%. While Home Depot has had to do many things right to fuel the company's incredible success, one move that has clearly paid off was its $1.6 billion acquisition in 2015 of Interline Brands. Just a little over two years removed from one of the company's largest acquisitions, let's look at how Interline is being integrated into Home Depot's larger business and how it has spurred growth for the company. Check out this year-to-date chart of Home Depot's stock price and the S&P 500's. Can Interline Brands even move the needle? Interline Brands is one of the nation's leading suppliers and wholesale distributors for those in maintenance, repair, and operations (commonly referred to as MRO). Its primary customers are facility and maintenance staffs at large multifamily residences, hotels, hospitals, college dormitories, and prisons. So while the average investor, or even Home Depot shopper, might not recognize some of Interline's brands, you can bet that maintenance staff personnel around the country do as they turn to Interline for HVAC, plumbing, security, and janitorial needs. So what's the big deal? Because Interline currently represents only 2% of Home Depot's sales, some might believe that it will never be big enough to materially affect the company's top and bottom lines. But that ignores the tremendous opportunity that lies ahead if Home Depot can continue a successful integration. Home Depot's acquisition of Interline Brands in 2015 gives the home improvement retailer one more growth catalyst for shareholders to enjoy. Image source: Getty Images. In Home Depot's 2016 fourth-quarter conference call, CEO Craig Menear said the total addressable multifamily, hospitality and institutional maintenance market is about $50 billion, of which Home Depot now has about 5%. In a later conference call, management clarified that no player in the industry commands a double-digit percentage of the market. That's enough unconquered market share to move the needle -- even at a giant retailer like Home Depot. So these are homes, places ... with beds is the way I think about it, that we're servicing as opposed to a single-family home. And the customer alignment is very strong as well. So we look at the Interline customers, [the] vast majority of Interline customers are Home Depot shoppers. So the product categories are very similar. The purchase occasion is somewhat different ... So we like the space. We think it's aligned with our core product, and perhaps most importantly, it's aligned with our customer. At the same conference, Home Depot's management gave several examples. In one store, a professional customer entered a store in a panic, they said. He needed five appliances delivered to his job site as soon as possible. The appliances were delivered just five hours later, according to management, who said that would not have been possible before the acquisition. Another example management gave was a contractor who needed to replace 40 toilet flappers on a hotel floor. The actual flapper might be identical to the one I would buy for my house, but a contractor doesn't need 40 flappers individually packaged, each with its own set of instructions. So, its different customers looking for the same product, but Home Depot can now package the two differently, meeting each of its customers' needs better in the process. The first phase of Home Depot's methodical integration with Interline Brands is now complete. This phase consisted of carrying Interline's products with delivery capabilities in its stores. In the second-quarter conference call, management said next-day delivery for Interline products is now available in more than 1,500 of its stores and in an additional 458 stores, two-day delivery is the fastest option. In the company's first-quarter conference call, Menear also stated that sales were ahead of what the company anticipated for this first part of the integration. The second phase of the integration is well underway and consists of allowing Interline customers to use a swipe card linked to their Interline account to make purchases at their local Home Depot or through the company's website. In the company's second-quarter conference call, Menear gave an update on how this phase of the integration was going: "Though it's early days, we are seeing an incremental sales lift from accounts who have been given the swipe card. Our deeper level of engagement with the Interline customers has helped to drive sales growth that outpace the company average in the quarter, and we remain very excited about the MRO opportunity going forward." Though there's more homework to be done, Interline gives Home Depot a greater foothold in a large market -- one where it should not have too much difficulty capturing greater share given the current fragmented state of that space. Additionally, Interline helps Home Depot deepen its relationship and engagement with its professional customers. All in all, Interline appears to have been a smart acquisition for Home Depot, and one more growth catalyst for investors to look forward to in the future.